Or does summer crafting just seem to go a lot more slowly? Admittedly, this summer in Toronto is uncharacteristically cool…but I still can’t seem to find the energy to do much in the way of, well, anything, to be perfectly honest. I have been doing bits and pieces of a scarf for my mom, and last week I cast on a hat in MadTosh Vintage for a colleague at work. He has proven himself knit-worthy by wearing (and gushing repeatedly over) a cowl I made him last year. I did put a new braid of fibre on my wheel – a braid of SweetGeorgia BFL in my favourite of her colourways, “Stormchaser”. (I also have this colourway on Tough Love Sock which I will eventually get to.) I am alternating this with a bobbin of the Humpspun that I started during Tour de Fleece, and my spinning progress seems to be much slower. That is to say, it seems to take a LOT longer to get through a braid. This might be a symptom of finer spinning. In any case, I am not even through the “fractal” half of the braid yet. But I love the colour so much that I don’t care how long it takes. I want this on every base! So even though this looks like I am doing a lot, I am really not. My heart’s not really in it and when I am too warm, my energy is just tapped out. Maybe this boredom is what’s feeding my start-itis that I am fighting, quite valiantly, I might add. Something to consider. What do you do when summer is here or your mojo is just plain out of whack? This entry was posted in Uncategorized and tagged baltic, BFL, indigodragonfly, knitting, lendrum, madeline tosh, madtosh, spinning, stormchaser, sweetgeorgia, vintage by Rayna. Bookmark the permalink. Re-organizing is a great idea. I keep my wound skeins separate from my unwound ones and try to make a point to use those first (I am not usually successful!) On Sunday I tagged all those in Ravelry so if I give in and start something new I won’t need to wind. 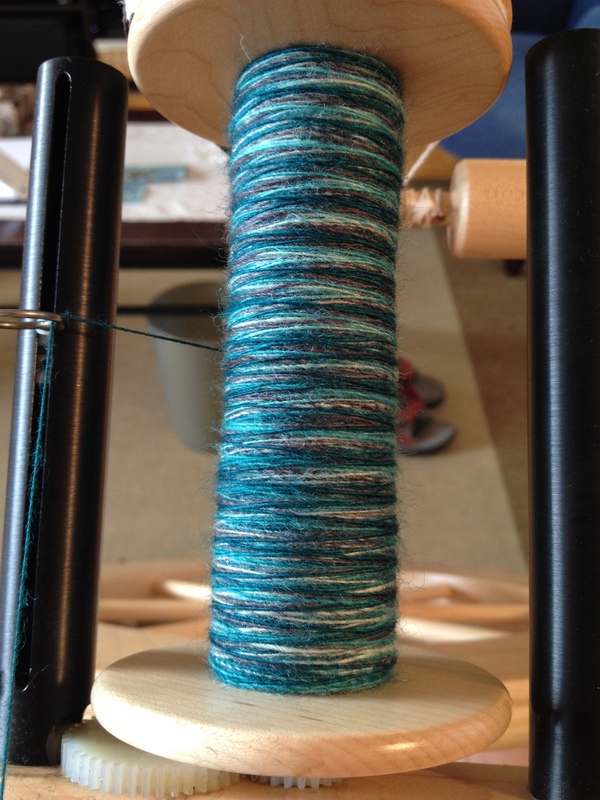 I think half my “problem” is that I spun every day during TdF and hardly knit at all so now I don’t really want to…I am having trouble getting back into it. Yeah, I haven’t gotten much done this summer. In part have just been too damn busy. But I did just do a super quick baby knit (hat pattern called Luuk) in hopes of getting my mojo back a bit. I hear you. I am doing that watch cap, but I am not really feeling that either. On the plus side, it is SO mindless that it’s progressing very quickly. I am over 8 inches into the body so decreases are coming soon. I always think I’m going to get lots done in the summer . . . but it never seems to work out that way. The siren songs of sunshine and open roads seems to call me. I wish that was my problem. I am not an outdoorsy person (and living in Toronto doesn’t really help that!). I am just plain lazy about it. Last night, I sat in front of the TV for three hours and didn’t even bother to find my knitting bag. SO not like me. I know it will all come back, but I wish it would do it soon! 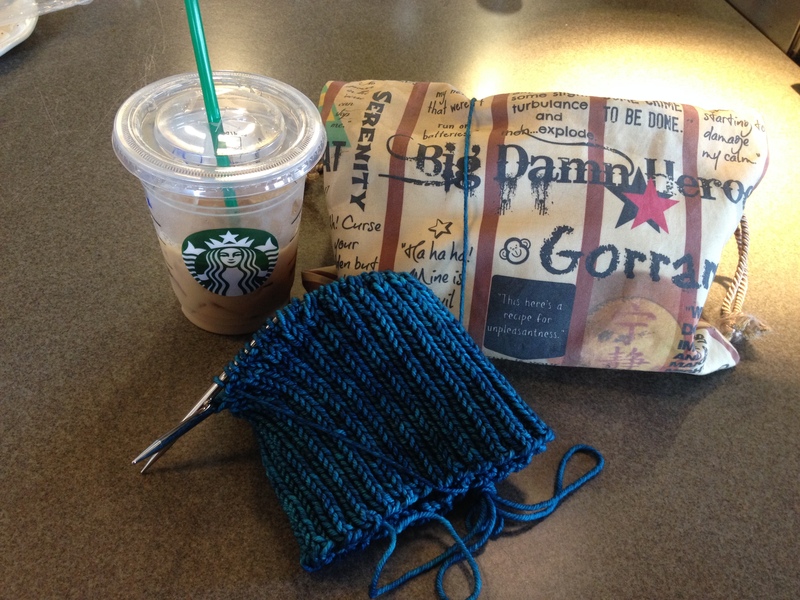 I’ve been kind of the opposite – I just finished college and I’d been dying to be able to knit non-stop. I was churning out a lot for a few weeks. Now I’m bored with my WIPs. So I’ve 7 projects on the needles right now but nothing finished. Sigh. I have about a dozen things, including the aforementioned hat (that I am about to run out of yarn on and have to rip back 😦 ) on needles and none of them are calling to me. Maybe there needs to be another pair of Hermione’s Everyday Socks OTN. I think it does go more slowly; it’s hard to get excited about knitting anything wool when it’s so hot. I get like that, for sure, but summer in Toronto this year hasn’t even really been overly hot, surprisingly! I do have another friend who knits in the summer but says she doesn’t spin because she feels like the fibre gets sticky and icky, but I haven;t found that.